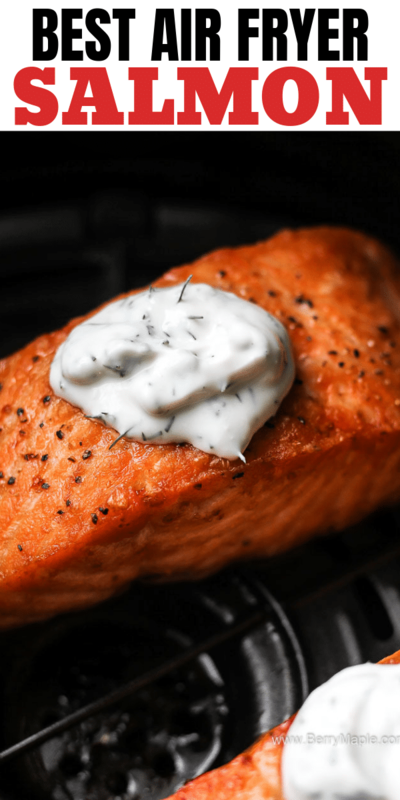 Perfect air fryer salmon fillet cooked from fresh or frozen fish. 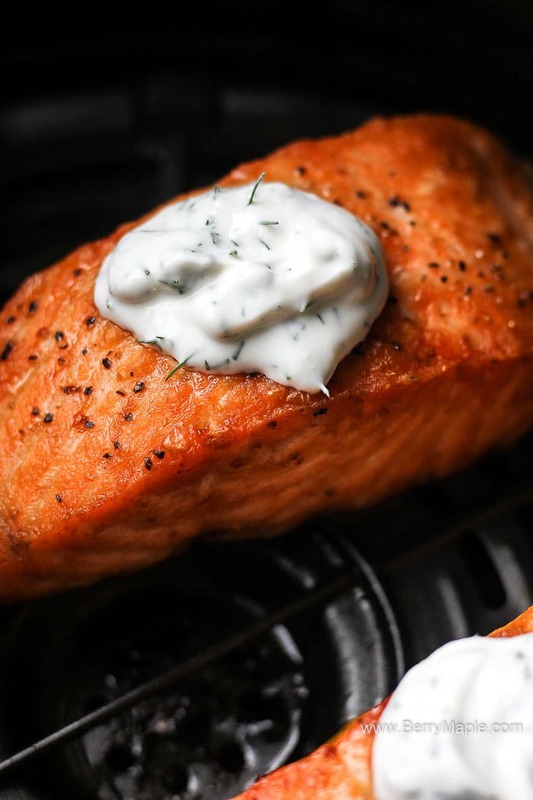 Infused with lemon and covered with Greek yogurt garlic sauce, this recipe will become your favorite. So easy and beginner and kids friendly. 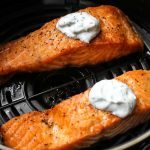 If you didnt try to make salmon in your air fryer, you should know- its incredible! Its flaky, its juicy, its healthy and very easy to make. Even a beginner can do it! Just like air fryer salmon patties, its delicious and very kid friendly. I like to buy a wild caught salmon at the grocery story but sometimes its just now available. 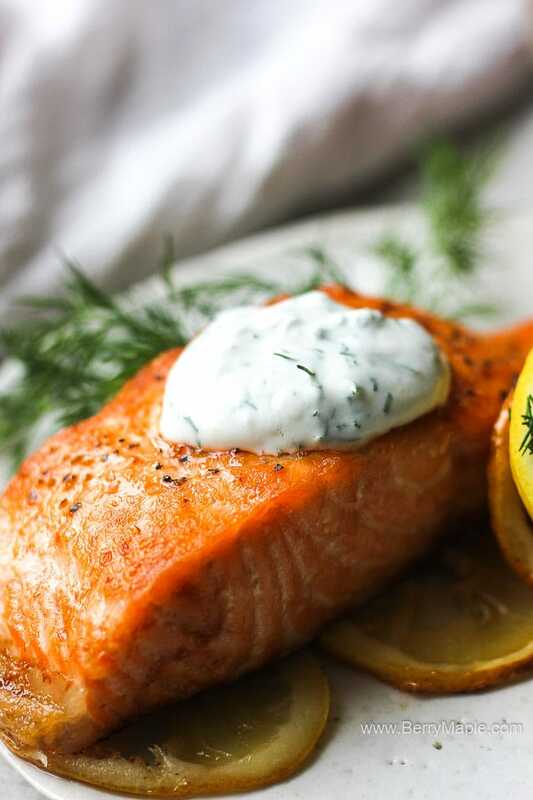 The cooking time between wild caught and farm raised salmon is the same, but the fat content is much higher in the farm fish, which makes it harder to overcook. 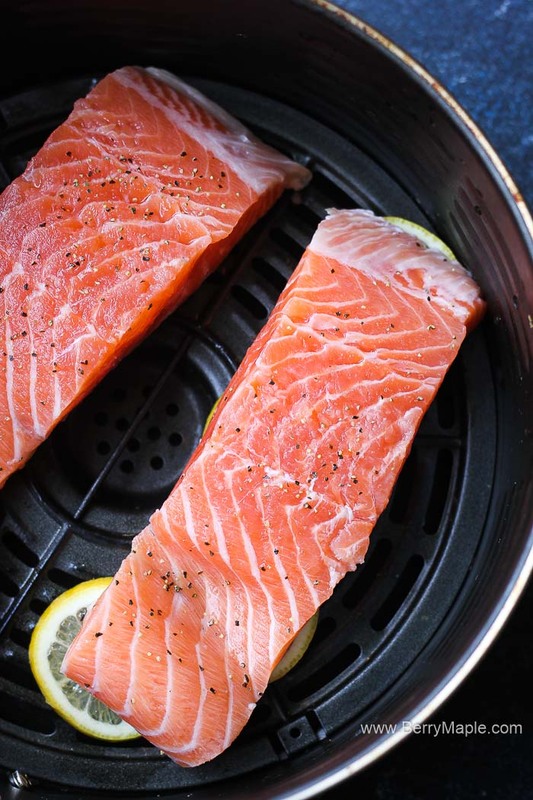 Basically the air frying time for salmon is 330 degrees for 15 minutes. The time depends on the thickness of the fillet you got. I cooked my salmon (see photos) for 15 minutes and it was perfectly done. I dont like raw fish and prefer it to be cooked all the way through. 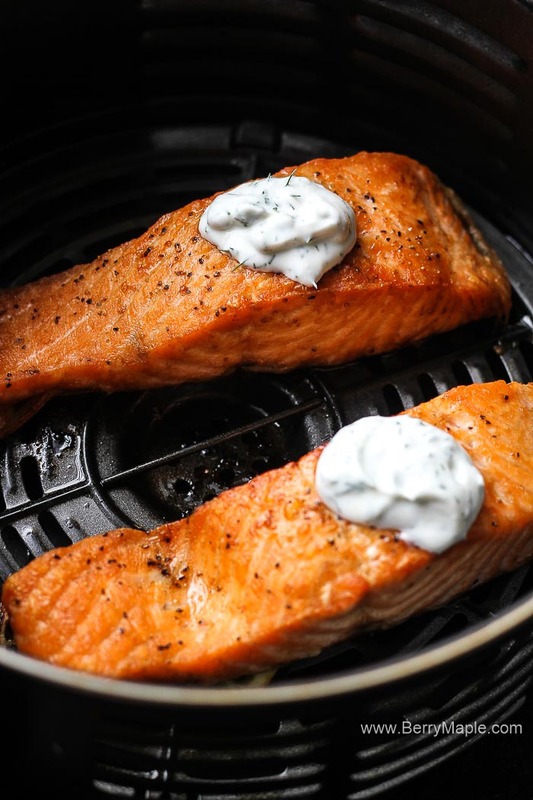 If you want to cook salmon in the air fryer from frozen, you will need to rise the cooking temperature to 360 degrees and cook them for the same amount of time. Salmon thaws out quickly ad very easy. Again, if you are going to cook salmon fillets the size that on my photos but from frozen, just cook them for 15 minutes at 360 degrees. Here are some nice side dishes you can add to your air fried salmon fillet- Air fryer french fries or Air fryer sweet potato fries. To prevent salmon from sticking to the air fryer basket i use slices of LEMONS! This trick is genius and very handy too! Just slice your lemons thinly and cover the air fryer basket with them (or just where the salmon pieces will go). Place salmon on top of lemons and cook. Will not stick! Add salt and pepper to the salmon fillet. Place fillets on top of lemons and cook for about 15 minutes at 330 degrees. Meanwhile make the sauce. 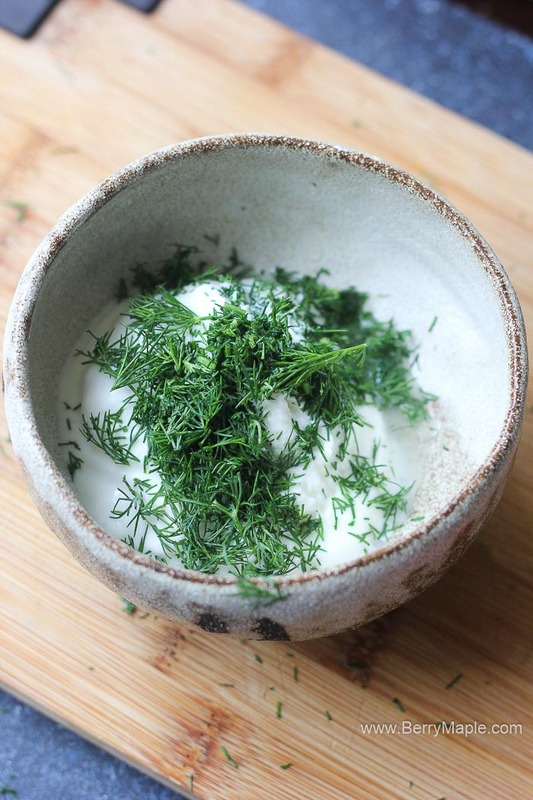 Mix yogurt with dill and garlic powder. Add lemon juice and salt and pepper if needed. Once the salmon is done, cover it with sauce and serve.